When I pick books for blogging, sometimes I go by award lists, but most of the time, I wander through the library and look for a promising plot with likable characters. 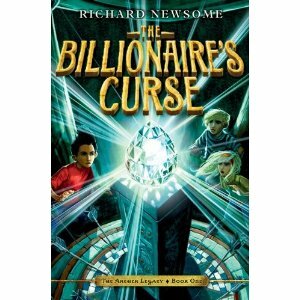 The premise of The Billionaire’s Curse sounded fantastic: a 13 year-old Australian boy, Gerald, suddenly finds himself heir to the mega-billions of his late aunt. His parents dash off on a Caribbean vacation, leaving him in the care of a stuffy butler. Included in his inheritance is a handwritten letter from his aunt that changes everything: she leaves him in charge of the mystery of her death. The letter predicts her murder, and explains that it is related to the theft of the world’s largest diamond from the British Museum. Gerald outsmarts the British paparazzi and Mr. Fry, the butler, makes it to the museum, and almost immediately finds his life in danger: a thin man who reeks of bleach holds a knife to his back and demands answers. Gerald is rescued by Ruby and Sam, twins who distract the thin man and save Gerald from a stab in the back with a stiletto blade. The kids embark on a race against the diamond thieves, trying to find a mysterious casket rumored to be a thousand times more valuable than the stolen diamond itself. Their search brings them to the countryside, an abandoned Tube station, an ancient, trap-laden family crypt, and a snobby country club. In the end, they unravel the mystery, expose the thieves, and everything is set to rights. I loved the Indiana-Jones-style traps and daring rescues, as well as the author’s playful treatment of the hippies who convene at the ancient pagan site for the full moon at Midsummer’s Eve. Though I did think that the author relied on too many improbable coincidences as plot devices, and the characters themselves are fairly flat and undeveloped, the action is fast and appealing to younger readers. I think this would be an excellent choice for reading aloud: the action will captivate listeners and leave them anxious for the next installment. However, if you’re looking for a good kid-powered mystery with strong character development and you’re easily irritated by unrealistic plot twists, then I’d recommend Blue Balliett’s books, instead. Reviews to come! Newsome, Richard. The Billionaire’s Curse. New York: HarperCollins, 2009. 344 pp. Grades 5-8. Check out Blue Balliett’s new website at blueballiettbooks.com. Lots of fun background about the real world settings for The Danger Box and her Calder/Petra/Tommy books.